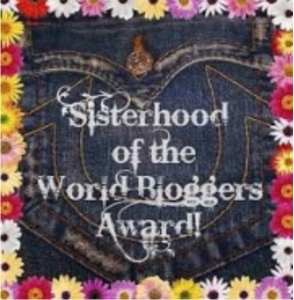 I would like to thank Sharon McGregor, for inviting me to join Sisterhood of The World Bloggers. It looks like a fun gig. If you could go back in your life and change one decision you made, what would it be? There’s a temptation to want to do this but the fact is there are many blessings that came out of what at times feel like poor choices. I try to comfort myself that I made the best choices I could at the time with the knowledge I had then. I would not be the person I am today if it weren’t for those decisions and the consequences of them. Even bad decisions can lead to positive growth and God can use any of our past for His glory when we surrender it to Him. What is the most intriguing book you have ever read? Well, the Bible would top that list for sure. I read a lot so trying to define the creme of the crop would be hard. When I was thirteen I read and reread S.E. Hinton’s The Outsiders. Still compelling storytelling. i memorized Robert Frost’s poem Nothing Gold Can Stay because of that book. For nonfiction: If I were to look at books I would want my kids to own: Intimacy with the Almighty by Charles Swindoll, Liberated through Submission by P.B. Wilson and anything by A.W. Tozer. For 2015, the non-fiction book of the year for me was The Extravagant Fool by Kevin Adams. For fiction: I love The O’Malley Series by Dee Henderson, My Stubborn Heart by Becky Wade and Healing Grace by Lisa Lickel flow off the top of my head as cherished novels I have read again and again. And anything by Georgette Heyer. I could make a much longer list but that’s a good start. If you could pick one word to describe yourself what would it be? If you could time travel, what period of history would you choose and why? Probably the Regency period (1811-1820) I love reading books from that time and would find it fascinating to experience it. Only for a brief period though. Jane Austen had to write everything by hand! Did you have a role model growing up and if so, what effect did he/she have on your life? My English and Speech teacher, Orin Mueller was so encouraging of my writing and speaking and finding creative ways to share my faith. That was huge. Pastor Mark Steele was my “boss” for many years at Stonebridge Community Church in Menonomee Falls, Wisconsin. He taught me firsthand about the importance of accountability. I learned that one of the most caring questions someone can ask me is “How is your relationship with God?” Is it any wonder that my contemporary romance series is set in the northwest suburbs of Milwaukee, and revolve around a fictional church called Orchard Hill? If you could plan a dream vacation, one that may seem out of reach, where would you go? I would return to Great Britian and spend more time visitng and touring. I was there once on a mission trip and didn’t want to come home. I think now that I’m older I would appreciatet the history and sightseeing even more than I did the first time. If you could choose any profession to follow, what would it be? I never planned to be an author growing up even though my favorite thing is to read. Being an editor was even further off my radar. But I think that right now I’m where God wants me to be doing both, as well as speaking at conferences. I enjoy my work. Pick a card, any card-greeting card that is. What is your favourite holiday? Probably have to say Christmas . . . that’s when I’m most likely to make my own greeting cards. I used to do over 100 of them but with my life busier now, I’ve had to scale that back and don’t make or send out as many as I used to. What is your favourite pet? Dog or cat? Gerbil or snake? Horse or hamster? Or none at all? I had a dog when I was a child but we had to give it away because I had terrible asthma/allergy issues. Bingo (Babette Suzette) was a silver poodle. I always mourned the fact that I could never have a pet but we did adopt a silly Quaker parrot about 20 years ago. My husband spoiled him terribly and he’s a snotty brat now. 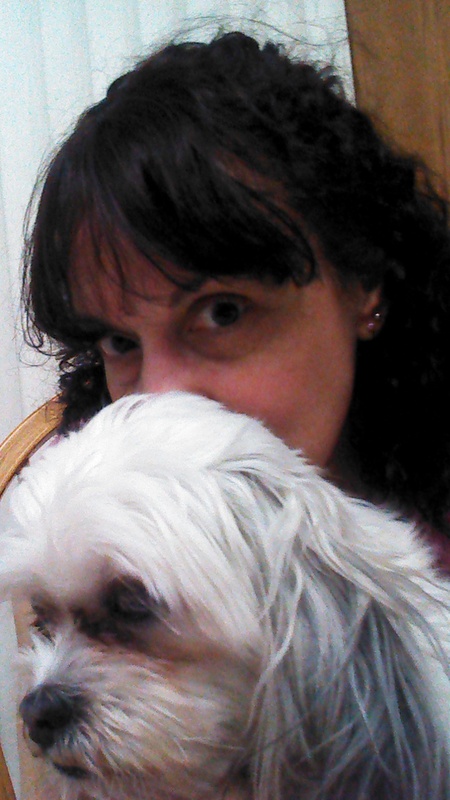 Over time, although I still have asthma and allergies, I learned that some animals didn’t make me sick. Two years ago we adoped our Maltese mix from a rescue. Spatzle is now six and sassy and my shadow and while I’m not especially fond of standing outside with him when it is 10 below zero, so he can relieve himself, I do adore him and am so glad he’s part of my life. What one thing would you like to see happen in 2015? My novel, Pesto and Potholes releases March 25, 2015, and I’m thrilled and terrified. I’ve written many books and this is my debut novel, and I think of all I’ve written, this one has more of “me” in it than any other. 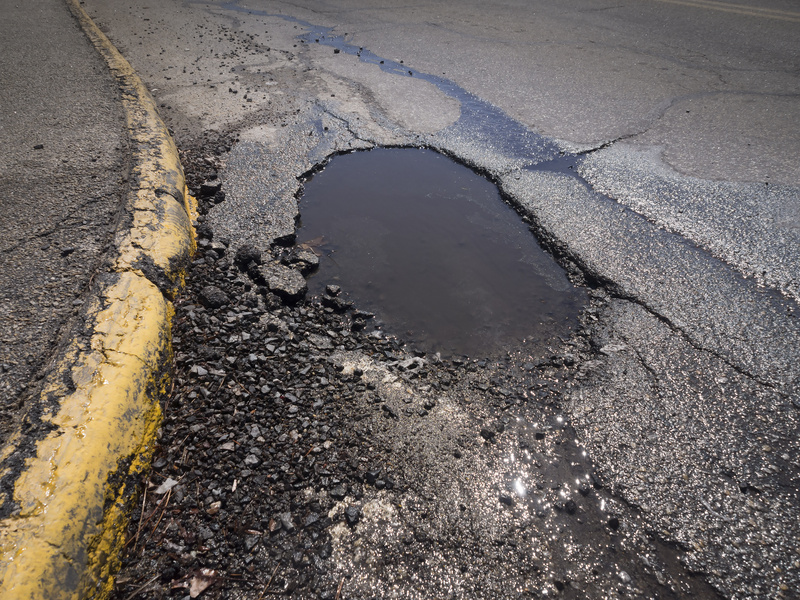 I hope readers will fall in love with Renata and Tony and find inspiration for their own walk with God in the “potholes” of their own lives. While it would be nice to sell lots of books, I think the greater reward is knowing that something you wrote impacted someone in a positive way. Having someone draw closer to God, is the greater, if intangible, reward. 2. If you could revisit any time in history, here would you go? What is happening? I was looking forward to Dee Henderson’s latest release with great anticipation. 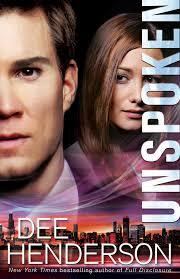 Unspoken, while not a part of a series, per se, does follow up on Paul and Ann Falcon’s story from Full Disclosure, but only as a background to the story that Bryce Bishop lives through. The story is intriguing as it starts out with Charlotte Graham but is never written from her point of view. She was involved in a crime that was supposedly solved. She had been kidnapped at 16 and released four years later, changed her name and never spoke of what really happened. Bryce Bishop is a God-fearing man who runs a successful coin business. Charlotte approaches him with the opportunity to purchase and resell, at a significant profit, millions of dollars worth of valuable coins she inherited from her grandfather. Neither knows at first that their partnership was set up by her security agent and her best friend. Bryce had been bored and praying for release from that when Charlotte mysteriously appears in his life. She’s a mystery that he slowly begins to uncover as he falls in love with her. Charlotte is not quite so convinced that they could be anything more than friends. As Ann and Paul Falcon work on trying to solve a cold case, and an investigative reporter digs into Charlotte’s past, it soon becomes clear that the two crimes are intertwined and that the criminal is still at large and a threat to Charlotte and her family as well as others. Can she, with Bryce’s help, come to help with the investigation? Can she also managed to answer the hard questions that plague her faith of where God was in the midst of terrible pain? This book was evidently heavily researched and I admire Dee Henderson for that attention to detail. The story itself is a slow-moving one. While dubbed romantic suspense it does not reach the level of intensity of previous stories she has written and is in essence more of a love story with a mystery woven in. Written only from Bryce, Paul and Anne’s perspectives, it is missing some intensity by not giving Charlotte’s point of view and perhaps letting us in to her deep inner struggle that goes beyond the words she shares with Bryce or her friends. While the ending was nice and all the loose ends were tidied up – it left me wanting more and in a way feeling cheated that there was only that hint of the healing that Bryce had been praying for. Unlike Full Disclosure, this part of their relationship was not explored further, but with the mystery solved, I suppose that was just not going to happen in at least this book. Maybe Bryce and Charlotte will show up in the next book and we can see how their relationship develops as the backdrop to another story. I love free books on Kindle because sometimes I find spectacular new favorites. 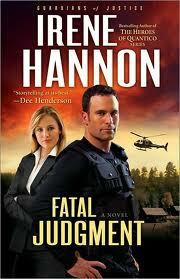 I found Dee Henderson that way and now I’ve discovered the fabulous romantic suspense of Irene Hannon in her novel Fatal Judgement (Guardians of Justice, Book 1). Jake Taylor is a U.S. Marshal who has been around the block and the world keeping people and countries safe. He’s recently transferred to St. Louis to be closer to family but has to hit the ground running when a murder happens at the home of a federal judge. His new assignment is to provide protection for her: Liz Michaels, the widow of his best friend who he believes is responsible for his death. Regardless of his feelings he has a sworn duty to guard her life and he will, until warmer feelings start to interfere with his normal professional facade and defense against his own buried grief. As they hunt down the killer, romance sizzles between the two but will the killer return and succeed where he failed before? Will Jake have the chance to tell Liz that he loves her before it’s too late? Irene has done fabulous research and her characters are multi-layered and the plot is enough that I lost valuable sleep. Faith plays a role in the lives of the characters as they struggle to depend on God in the midst of deep grief and loss. This is the first in a series and I cannot wait to read the rest of them! I loved the O’Malley romantic suspense series by Dee Henderson and was excited to finally get to read the prequel to it all: Jennifer. If you have not yet read the series, let me encourage you to start with this book. If you have read it, then go ahead and read Jennifer but be aware: It truly is a prequel. It does not weave in and out of the entire O’Malley series. I was a bit disappointed by this although for it being a novella I knew it was impossible for that to be a realistic expectation. Now I want to read the entire series all over again just to see her story in clearer detail. Jennifer is a love story. It is the story of Jennifer’s falling in love with Tom and with Jesus, all before her dreadful diagnosis of cancer. Her love for her brothers and sisters too is clearly evident in this novella. 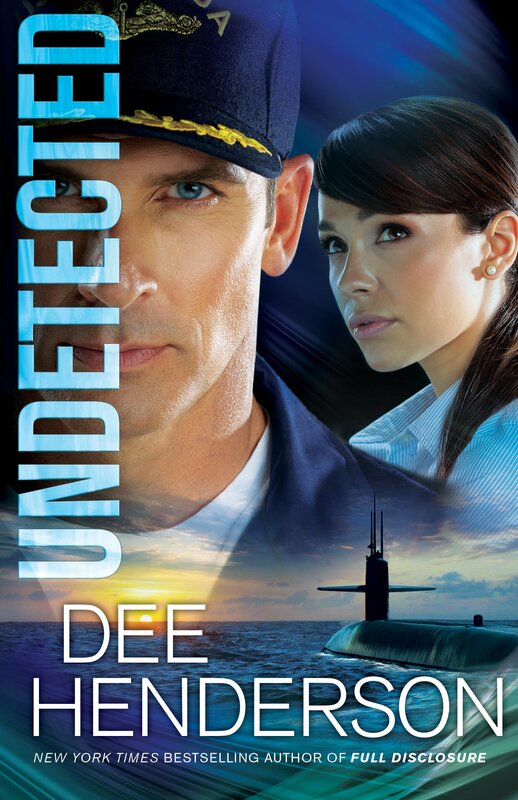 This is quite a departure for Dee Henderson who specializes in romantic suspense. There is none of the adrenaline rushing suspense of her other novels evident in this book. This is pure romance with a mix of tragedy thrown in. It shows Jennifer’s indomitable spirit that prevails throughout the O’Malley series as her passion is to use whatever time she has left seeing her adopted siblings come to a personal relationship with Christ. If you want your heart twisted like a wet dishrag – read this story. It is filled with love and passion and I only wish it had been longer, although Jennifer’s story really is much longer as her physical presence threads through the first five out of six of the O’Malley series. Well done Dee, and thank you for being willing to put your hand to this lovely novella.